A maximum of 6 passengers plus captain/crew are allowed on the boat (no exceptions – USCG law). All passengers must sign our waiver & declaration of good health before boarding our boat. Any passenger under the age of 18 MUST be accompanied by an adult, who is also required to sign on any behalf of any minor. Children 13 years and younger are required to wear a life vest at all times on board the boat (VT law). Click here to make your reservations or call (802) 828-SURF today! You can book any amount of time you would like within availability. All rates include boards, life vests & gear (excluding wetsuits), gasoline, and USCG captain / certified instructor*. Bottled water will be provided on the boat, along with ice/cooler for your own beverages. If you appear to be intoxicated, you will not be permitted on the boat. Smoking is not allowed. We accept Visa/MasterCard, & Apple Pay (a 5% service charge will be added for all credit/debit transactions to cover service costs). No service charges for cash/Venmo. Please be ready with a choice of payment at the time you are making a reservation to hold your spot! ALL LESSONS MUST BE PAID IN ADVANCE (no exceptions). See cancellation policy below. *Captain/instructor Greg Anderson is certified through the American Water Ski Association along with American Red Cross CPR and First Aid. He is a licensed USCG captain and 11 year Vermont Public Vessel Operator. 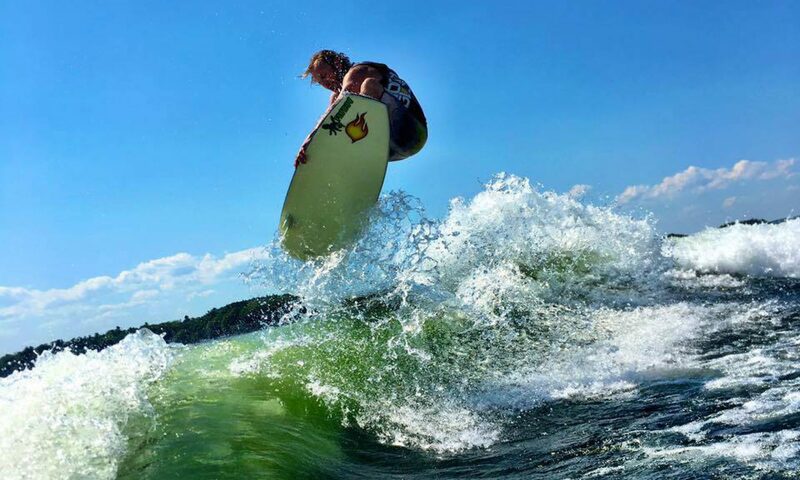 Our boat and wakesurf school are fully insured and safety for our passengers is our #1 priority! Our insurance requires that all riders wear a life vest while surfing. CANCELLATION POLICY: We have a 48 hour cancellation policy on the weekdays and 72 hour policy for weekends. Any cancellation not made within this window will NOT be eligible for a refund of any kind – transferring dates is not an option. This policy is in place because during our busy season, we have to turn customers away as we are booked up! WEATHER: As they say in Vermont, “Don’t like the weather? Just wait a minute!” Only severe weather conditions such as rain/lightening/thunder, high winds/waves or heavy downpours will temporarily close the school and require us to cancel a surf session. In such case, 100% of your fees will be refunded or applied to another available date. Unfortunately, we cannot ‘bump’ someone from their previously scheduled reservations but will do our best to accommodate all parties.